Heat oil in large soup pan over medium-high heat. Cook garlic and onion until they are golden brown, about 1 or 2 minutes. Add the rest of the ingredients and bring to a boil. Lower the heat so the mixture is at a light simmer. Place a lid on the pan. 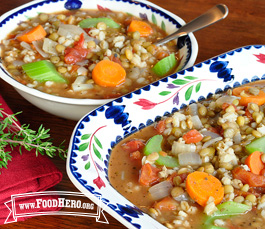 Cook until the barley and lentils are tender, about 1 to 1 1/2 hours. Serve hot in a soup bowl. Use any fresh, frozen, or canned vegetables you have on hand.